Today is sure to be a #SundayFunday for the rum fanatics out there. Even if you don't drink, I have a few fun Caribbean-oriented recipes for you to try! 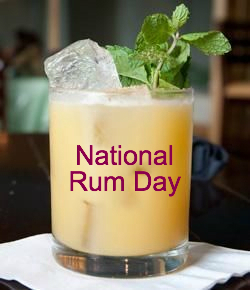 Yesterday we had National Relaxation Day and today we have National Rum Day! What a great weekend combo. It's always nice to have a little unwinding time while also having some time to enjoy yourself. That's exactly what my sweet little momma and I did yesterday! The kitchen has always been a way for my family to come together so I'm excited to share a little bit of that time with you all today! A few summers ago, our family took a trip to the U.S. Virgin Islands. Every since, we have loved making this rum drink at home when we're together! It's a great way to bring the Caribbean home with you. This recipe was amazing! I will say that my mom and I are no grill experts so we cheated a little bit. We made this altogether in a pan but it turned out just as great. It had just enough spice and the pineapple cut the kick a little bit. I could go on and on about this recipe. (It's pretty healthy too!) We switched out the jasmine rice for basmati and it turned out to be delicious. I highly recommend pairing the jerk shrimp with a little bit of coconut rice. It doesn't get much more tropical than that! Oh my goodness it's a must for a weekend treat. There is absolutely nothing redeeming about it but it's delicious and worth every bite. Make sure to whip this up for a little treat after all your other Caribbean dishes!